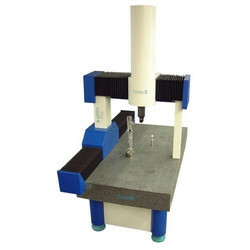 Prominent & Leading Manufacturer from Pune, we offer 3 cmm machine, manual coordinate measuring machine, 3d-measuring machine sigma cnc and 3d-measuring machine rapid-plus cnc. 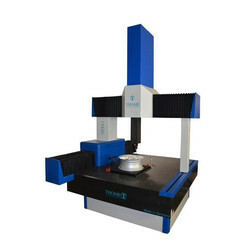 We are offering 3 CMM Machine to our client. 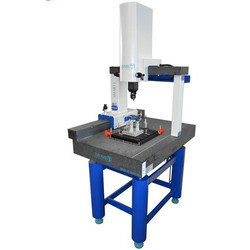 We are offering Manual Coordinate Measuring Machine to our client. Granite guide ways of highest quality secure high thermal stability, precision, and mechanical rigidity. Optimized air bearings are used to realize the highest precision and lowest air consumption. The single lock for each axis enables the Øoperator to lock an axis and to perform precise measurements within a plane. All geometric elements can be measured, graphically displayed and recorded. Evaluation of all shape and position tolerances. ISO tolerance database is integrated. ØMeasuring programs via Teach-In. CAD files in IGS and STEP format can be imported. Elements can be selected by clicking on the CAD model to create the nominal data. We are offering 3D-Measuring Machine SIGMA CNC to our client. Granite guide ways of highest quality secure high thermal stability, precision and mechanical rigidity. Joystick MCU Lite by RENISHAW with function keys, speed regulation and emergency-stop. Probe changer MCR 20 For full automatic system operation. Stores up to 6 probe modules. All geometric elements can be measured, graphically displayed and recorded. Evaluation of all shape and position tolerances. ISO tolerance database is integrated. Highest precision, robustness, thermal stability and highest stiffness are guarantees through fine guide-materials like granite or ceramic. Optimized air bearings ensure perfect, mechanical accuracy. The big center-sleeve cross section with that optimized support against rotation around the Z-axis. Ideal for long styles useable. Additional finely controlled, the pneumatical weight balance of the Z-axis. Enclosed guide-ways Protect against dirt and chemical factors. The additional closed table guide moreover protects the machine during loading up the work pieces. We are offering 3D-Measuring Machine RAPID-Plus CNC to our client. Joystick MCU Lite by RENISHAW with function keys, speed regulation, and emergency-stop.